Lipsticks tend to be my weak spot, which is why I’m constantly (literally, constantly) buying more. Because I hoard so many lip products it is normal for a lipstick to get lost amongst the thousands of other lost lipstick souls in my collection that I forget about (okay, I don’t have thousands). So, when certain lipsticks become my favorite, you know they are good! My biggest turn off, in relation to lip products, are ones that are super sticky and tacky, which is why I enjoy a nice velvety or matte, better yet a velvety matte, finish. So, when I saw Stila’s Stay All Day Liquid Lipsticks, I had to try them out for myself since they’re supposed to apply like a gloss and dry to a matte finish. I only own three lipsticks from their collection, but I definitely plan on purchasing more (I got my eye on you, Beso). 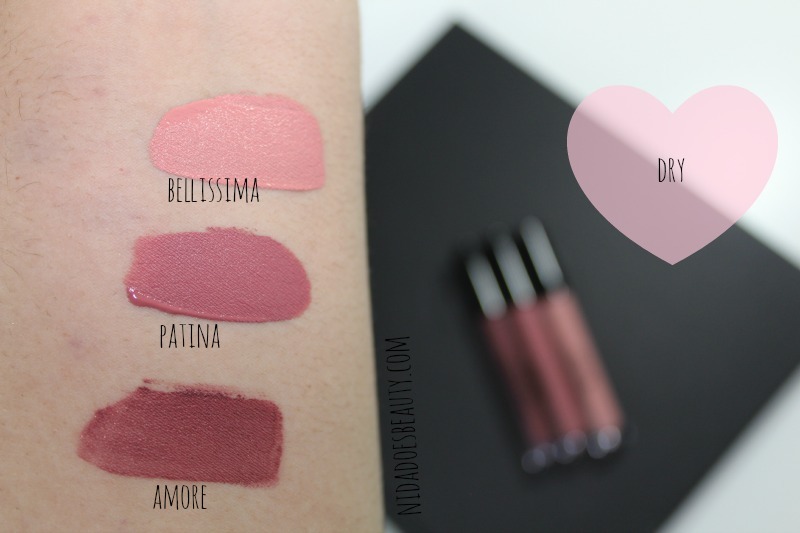 Stila Liquid Lipsticks ( L to R): Amore, Patina, and Bellissima. Amore | This one is a plummy shade that has some golden shimmer running through it. I tend to despise shimmery lip products, but this one is still one of my favorites because the glitter is not visible once you apply it to your lips. Plus, it sets to a nice matte finish. Even though the formula of this specific shade is not as creamy as the next two colors I am about to talk about, it still glides on easily while being extremely pigmented. This shade is great for anyone who loves dark lips, especially in the fall, but doesn’t want to wear a really vampy lip. Whenever I want a nice deep color, but nothing too dramatic, I go for this shade. It looks gorgeous paired with a soft makeup look that focuses on lots of lashes and this lip color just happens to be the pièce de résistance. Patina | A dusty rose mauvey color that is seriously so gorgeous. Sometimes finding a neutral color can be hard for medium to darker skin tones because it can really wash you out if it isn’t the right shade. This one is a perfect every day color because it’s not too bold, but it does add some color to your look. It is actually very similar to the color that she-who-must-not-be-named (aka Kylie Jenner) has been infamously sporting on her lips lately. Bellissima | A pale neutral pinky peach. I absolutely love this color, and a while ago this was literally the only color I would wear on my lips; I even dedicated a whole post to it because it is that great! Again, this is another color that is great for an every day daytime look because it is nice and subtle, especially once you blend it out with your finger. It is also great if you want to do a dark smokey eye because it is neutral and will not clash with your eyes. 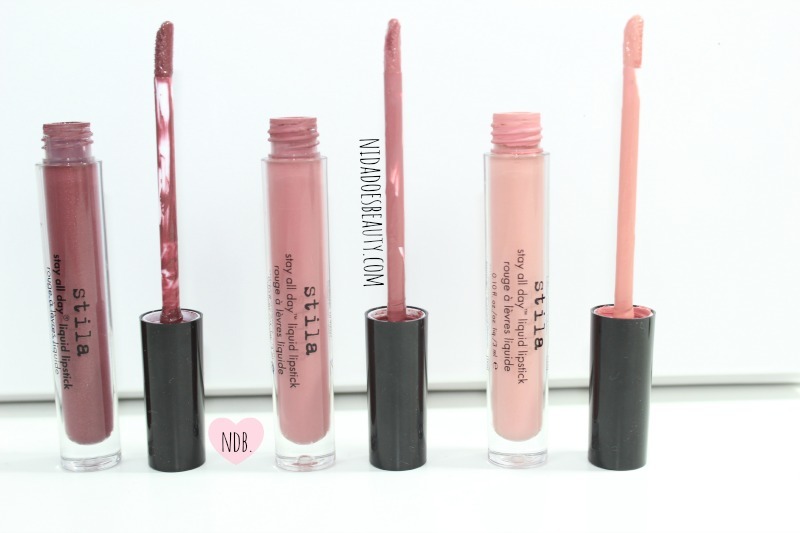 The Good | The consistency is creamy, and it dries to a matte finish that really doesn’t budge. I wouldn’t say that it “stays all day,” but it does last a long time even if you eat, drink and talk a lot. Not only do I love a matte finish, but I love one that is highly pigmented and opaque. If you have pigmented lips and have trouble finding a lipstick that shows up true to color, while covering up the natural pigmentation of your lips, this lipstick is perfect because one swipe of this is very opaque. The color is also buildable so you can make it as opaque as you like. The Bad | I do have to say that the formula can be a bit too drying at times and sink into the fine lines of your lips if you haven’t properly moisturized and exfoliated. Even though the color lasts for a few hours it can become a bit uncomfortable because of how dry it is. Another downside is that it can get a bit messy since the brush picks up a lot of product. So, I would suggest applying a little on the center of your lips and then blending it out with your fingers for a more natural, blended look. Continue applying it in this manner until you have reached the opacity you like. The Verdict | Although the formula is a bit drying I definitely think the pigmentation and finish are worth it– you gotta take the good with the bad, right? The doe foot applicator also applies the product smoothly, and as long as you’re careful with how heavily you apply it, it goes on beautifully; otherwise it can get messy. If you want a long-lasting, opaque, and matte lipstick then this lipstick just might be up your alley! Do you have a favorite matte liquid lipstick? Will you be trying these out? Have you tried them before? Let me know in the comments!